TORONTO -- Before landing the manager's job with the Toronto Blue Jays, Charlie Montoyo had little time to prepare for the interview process. 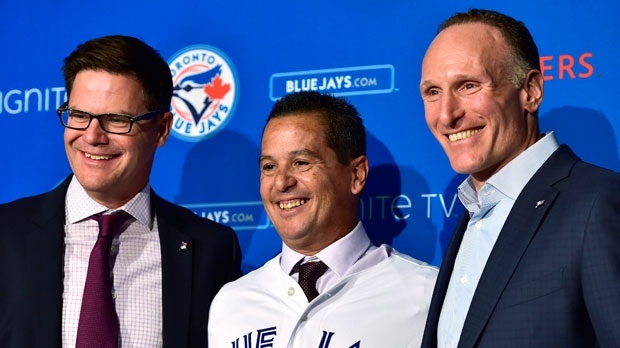 He went to a downtown restaurant with general manager Ross Atkins and team president Mark Shapiro just two days after they first reached out to him. "It was supposed to be an hour-(long) dinner," Montoyo said. "It took forever because the waiter took forever. So that worked out for me. I cannot wait to see that waiter so I can tip him even more because it was awesome -- I got to know these guys more. Atkins and Shapiro were also impressed. Montoyo flew home late Wednesday and got the good news the next day. He was the team's choice to become the 13th manager in franchise history. "I would say excitement would be putting it lightly," Atkins said after formally introducing Montoyo on Monday at Rogers Centre. "I'm elated. I think when it started to become clear to me that he was the right choice, and to the point of him agreeing to the terms, I was absolutely elated and that has only continued to grow as I have gotten to know him more." Montoyo spent last season as a bench coach with the Tampa Bay Rays. He managed teams at every classification in the Rays' system, including seven years at the helm of the triple-A Durham Bulls. His three-year deal with Toronto runs through 2021 and includes a team option for 2022. Montoyo succeeds John Gibbons with the Blue Jays, who are coming off a disappointing 73-win season. The team announced late in the regular season that Gibbons would not return as skipper. Montoyo, 53, spent 10 years as an infielder in the Milwaukee Brewers, Montreal Expos and Philadelphia Phillies organizations. He retired as a player after the 1996 season. He compiled a 1,266-1,142 (.526) minor-league managerial record before taking on a third-base coach position with the Rays in 2015. In Toronto, he'll be tasked with guiding a team that has some solid young players and a few top-shelf prospects but is likely at least two years away from contention. "I don't think that way, we're going to play to win from the beginning," Montoyo said. "I'm not even thinking that way. From the first game of spring training, we're going to play to win, then whatever happens after that, happens after that." First on his to-do list will be getting the coaching staff in place. Once that's finalized, he'll start planning his approach for the 2019 campaign. "I've already talked to Ross about it -- I haven't been able to sleep -- because that's my No. 1 goal is to find a coaching staff that will help these kids get better," Montoyo said. The Blue Jays made appearances in the American League Championship Series in 2015 and '16 but have struggled the last two years. During that time, the team's farm system has become much deeper and there are some youngsters -- most notably top prospect Vladimir Guerrero Jr. -- who could make the jump to the big leagues this spring. A native of Florida, Puerto Rico, Montoyo's lone big-league experience as a player came in 1993 with the Expos when he appeared in four games. Guerrero's father was on that team and they remain friendly. "I can't wait to see Vlad and give him a big hug and I'm sure he's going to be happy that I'm the manager of his son," Montoyo said. As for his managing style, Montoyo described it as a "blend of old-school and analytics." Communication will be at the forefront. "I think that's one of my strengths," he said. "I respect the players because I know it's not an easy game to play. So whatever I do as a manager, I think as a player. How would I feel when somebody is talking to me?" Montoyo, a sixth-round selection by Milwaukee in the 1987 first-year player draft, also coached Team Puerto Rico in the 2009 World Baseball Classic. He was named International League manager of the year in 2010 and 2013. "I'm excited about Charlie, excited about where he's been and what he's done," Atkins said. "I'm really fired up to get started with him."